OOIIO Architecture completes the construction of a new single-family housing project. It is a work done with much love for a young and modern couple who wanted a comfortable, bright and different house. Casa GAS has been designed hand in hand with the clients, who from the first moment were personally involved in making their home as special and personal as possible, letting the architects work and listening to their advice, proposing ideas, participating of the exciting process that means to build your own house, to materialize a dream. 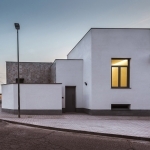 The project of this house came up when the architects tried to introduce everywhere the natural light in a not very big plot, in a corner, in a village in Toledo, central Spain. OOIIO´s team decided to organize the house program to satisfy the client’s needs in the most efficient and simplest possible way, always thinking in the natural light. For this purpose, they located four patios, designed and strategically placed in the plot, which are four light wells, four natural ventilation distributors, alternated throughout the site. Among these patios grow volumes that reach different heights depending on the function they hold. Thus, the highest will be the one corresponding to the most “noble” living-dining area and the lowest to the garage. 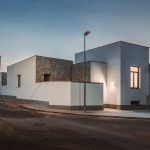 The house is white, clean, with simple and clear lines, with window holes strategically placed to enrich the composition of its vertical panels. 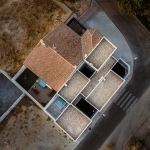 But the facades of the courtyards could not be shown like the rest of the house, they are the “raison d’être” of the project, the heart of its architecture, that’s why we express its importance also in the materials that cover them, playing with some ceramic pieces, making them to stand out and complete the composition of the whole house. 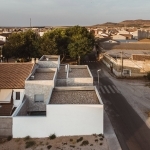 The materials are fundamental always in the architecture, and in the case of this project one of them, the ceramics, becomes the protagonist: The traditional patios of La Mancha usually play in their lower part with ceramic baseboards that actually come from a much older tradition of the different Mediterranean cultures. 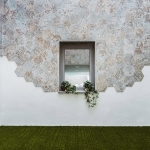 The architects of OOIIO have gone around the traditional skirting boards, making now the upper part of the patio the one covered by hexagonal ceramic pieces and the lower part the one clean of them. A set of materials that accompanies the fall of light through the courtyards and brings a lot of personality to this housing project. 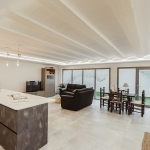 The basement of the house that would normally be understood as a dark and closed place, suddenly becomes a very special place, natural light falls through the four patios at once, becoming an open, fresh, protected and very bright floor. 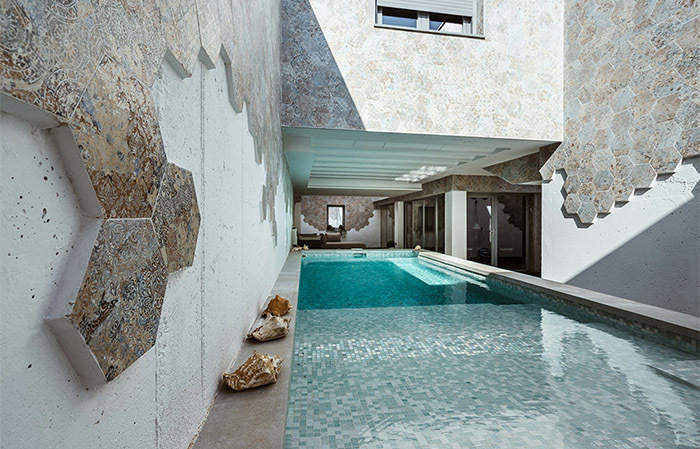 The work carried out with the interior design of the house served to complete and enhance everything expressed in the rest of the building, adapting at all times to the personality of the clients, achieving a project of fresh, simple, original and fun housing. Team: Joaquin Millan Villamuelas, Natalia Garmendia Cobo, Jessica Bérard, Paolo Mercorillo. Structures: Consultora CPE, Juan Vallejo. Civil Engineer: Esteban Martín Tesorero. Safety Manager: Esteban Martín Tesorero.